Dehydrating food is a great way to preserve many fruits and veggies from your harvest for a very long time. It is also a great way to taste some things that you have been eating your whole life, a bit differently. 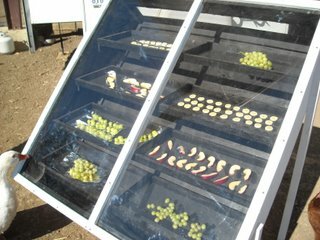 Here is a great solar dehydrating project from the blog The Sifford Journal that outlines how you can utilize the sun by building your very own dehydrator with some simple materials found at any home center. 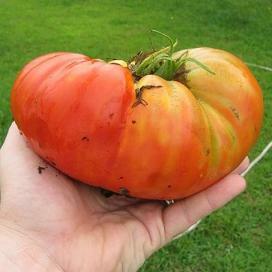 We have been posting a number of features on tomatoes lately. And why not! Tomatoes are the king of the garden. More people grow tomatoes in home vegetable gardens then any other fruit or vegetable. Check out this tutorial of getting more water to your tomato roots for better growth that we found on "A Sonoma Garden". 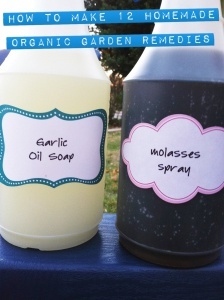 This is as about as simple as it is going to get when it comes to watering the roots of your tomatoes. With some simple supplies and a few minutes of your time, you can create this set up in no time. Grow Your Best Tomatoes Yet! Tomatoes are without a doubt the king of the home vegetable garden. Tomatoes, depending on which survey you read, are about 4 to 1 favorites over the next in line, cucumbers or peppers, as to which fruits and vegetables are grown most at home. Who can argue about this tomato fact? Tomatoes are easy to grow in almost every climate, and with over 2,000 tomato varieties to choose from, you are bound to find some tomatoes that you will enjoy eating. Not only are tomatoes easy and great to grow at home, the health benefits of tomatoes are wonderful as well. Packed with the healthy carotenoid, Lycopene, which, in a recent study, has been shown to reduce the risk of stroke and cancer, the tomato should be a staple in your garden, if it is not already. To grow your best tomatoes ever, let’s talk about what you will need in order to accomplish this fairly easy task. Of course, just like with any other fruit or veggie, tomatoes need a great foundation. In this case the foundation is your soil. Be sure to work in compost, seasoned manure etc. throughout your offseason. If you are new to gardening and you are growing tomatoes for your first time, you can always pick up some great seasoned manure at your local home or garden center for about two dollars a bag. Mix these ingredients thoroughly into the soil as they contain all of the nutrients your tomatoes will need to grow and produce wonderful tasting fruits. Tomatoes love the sun. Choose a spot that receives a minimum of 8 hours per day, more if possible. The more sun your tomato plant receives, the better your tomato plants will produce. Keep the soil your tomato plants are planted in moist but not saturated. Do not overwater your tomato plants. Too much water around the tomato plants’ roots may cause root rot. Be sure that the garden beds, pots or containers you use, drain properly. To increase drainage, mix in some peat or coir with your soil. Either of these products will make your soil friable, allowing excess water to drain, but keeping enough for your tomato plants’ needs. If you are growing tomatoes in containers, make sure there are enough drainage holes to allow excess water to escape. If your growing season is short, and you are growing your tomatoes from seeds, then you will need to start indoors. Visit the USDA Plant Hardiness Zone Map, type in your zip code and you will be able to obtain your area’s frost information. Knowing when the potential last frost date in your area occurs will go a long way as to when you can start your seeds indoors. Tomatoes grow well spaced out in as little as twelve inches apart, however, if you have more room to spare, then by all means spread them out. Most tomato varieties need some kind of vertical support so that they are not flopping over onto the ground which could cause other issues you’d rather not have to deal with. 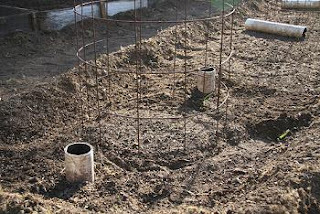 While there are a wide variety of methods, the two easiest ones are tomato cages and tomato stakes. Cages are available for a few bucks a piece at your local home or garden center. Tomato stakes can be anything from long pieces of wood, to fancy stakes from the store. The choice is yours. I use tomato cages. I always have. To me, they are just easier to maintain. Your tomato is ready for harvest when it has reached its full color. Since tomato varieties come in all kinds of color from red, orange and yellow, up through, purple, black and brown, you really should know which variety that you have, so you know when to pick. On a final note from my own experience. When growing smaller varieties such as cherry, grape and pear, one or two plants can produce enough tomatoes to feed a family of four, so plan accordingly. One year I planted six, yes that is six, grape tomato plants, and ended up with so many I literally could not keep up with picking all of them, or know enough people to give them away to, have enough canning recipes (or jars for that matter) to use all of them. 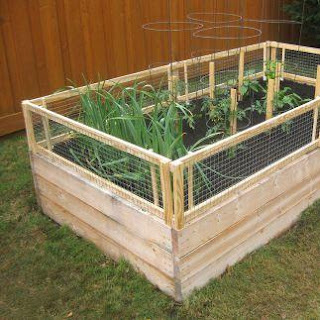 Here is a sturdy trellis that can be used for all kinds of vining fruits and veggies. 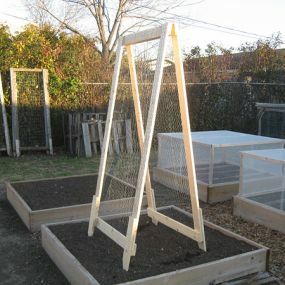 One of the best parts of this DIY trellis is that, because of the hinges at the top, it is adjustable to your garden bed size. So regardless of whether you have a 4 foot by 4 foot raised bed square foot garden, or something larger, you can easily adjust this for the size you need. Because, it is made out of some basic supplies, you may already have some of the items needed to build this sitting in your shed, basement or garage. I know I do. If you live in an area like I do where the rabbits (and other pests) are a plenty, then you already know the pain of trying to keep them from eating your garden. Normally you would put up some poultry (or other type) fencing to keep them out, attaching the fencing to posts. What happens is, over time, that fencing will break down and have to be replaced, which could be a pain. Here is a great project where you can section off your fencing, and over time, only replace the sections that are worn down, as opposed to having to replace the whole thing, or doing any fancy fence mending. 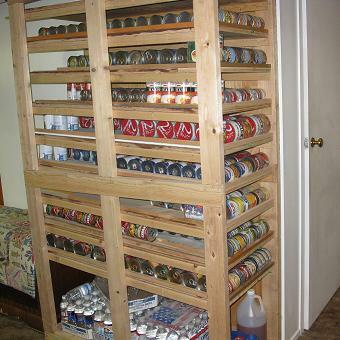 Do you like to can the food you grow? If so, then you probably already know about your storage needs and of course rotating your food so that you are consuming the varieties that have been around the longest. Here is a great idea from LDS Intelligent Living!. A slanted storage shelf that you can build yourself with some supplies found out any home or garden center for just a few bucks. There is plenty of room to store all of your items and the best part, because it is slanted, as you remove jars from your shelves, the remaining items will slowly move their way down to the front. You simply add the new supplies to the back! You have gardening in the bag! Literally, you can grow your garden in a bag. If you are short on space, time and money, then try this great idea from Mother Earth News Magazine and grow your fruits and veggies in a bag! I have had a few different sources tell me that when you trellis certain items, that their yields will be greater. Peas are one of those items. If you are not sure how to build a trellis for your peas, then look no further. Here is an easy one for you to tackle if you have a few pieces of would, a ball of string and some basic skills. An excellent trellis for the peas you are going to grow. 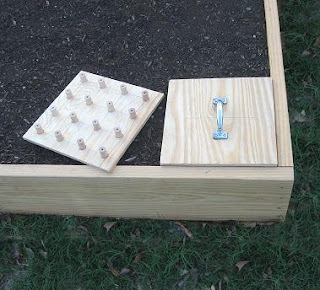 Here is a great planting template that you can make out of some wood, dowels, a few screws and about an hour of your time. 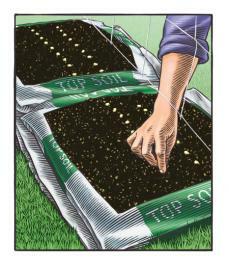 Compliments of Greg Holdsworth, this template will even space out those seeds or other items you will plant. There are a number of safe methods you can use to keep pests and disease from destroying your home vegetable garden. Here are 12 really good ones from Hope Gardens. In a few minutes, with some basic low cost items, you can be on your way to having the best vegetable garden you ever thought possible.